Frederick Walter Champion: What is the Use of Leopards? 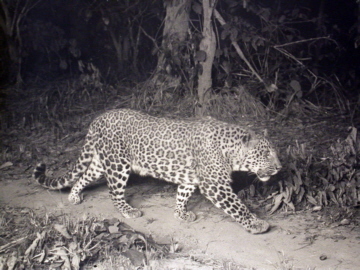 What is the Use of Leopards? Frederick Walter Champion was a forester in the United Provinces, with an intimate knowledge of the Sivalik hills and the wet savannah. After World War I he gave up shooting, partly due to revulsion with slaughter and out of an interest in photography. An early advocate of wildlife protection, he pioneered flashlight photography using trip wires. His photographs are among the first of free-living Tigers and Leopards in India. His essay "What is the Use of Leopards?" was published in 1934 in his second photo book "The Jungle in Sunlight and Shadow", of which excerpts are presented here. The photographs taken in the 1920s are by courtesy of his grandson James Champion. Evidently it was not the Tiger alone that had found someone to champion its cause. Some people – sportsmen these – claim that the Leopard was specially created in order to provide the exile with good sport; others state that such a marvellously beautiful creature requires no justification for its existence; another class of thinkers vehemently uphold the idea that the Leopard, like the Tiger, is an anachronism which should be wiped out at the very earliest opportunity. But the real facts are that the Leopard is a very important unit in the general scheme of animal life in India. Deer and wild pigs are extremely prolific and voracious animals which, if allowed to breed and increase without any check, would soon become so numerous that they would consume all the available food inside the forests they at present mainly inhabit. When this food had become exhausted they would scatter in all directions, and would thus become a very serious menace to the vegetable and cereal food supply of man and other creatures. No: Nature knows better than that, so she arranges a balance between the Ungulates and the Carnivora which works in an astonishingly efficient manner. In India sportsmen are constantly shooting the carnivora, and, considering the extreme efficiency of modern firearms and the great facilities afforded by the advent of the motor car, it is remarkable that they have managed to keep up their numbers; although Tigers are undoubtedly less common than they were, say, a century ago. Hence many forest officers are of the opinion that it is high time that the greater carnivora were afforded some measure of protection, if the normal balance of nature is not to be seriously upset. Every creature has its definite place in Nature's great balanced scheme of wild life, and even the Leopard, despite his numerous detractors, has ample justification for his existence. The Leopard is certainly no more popular in the Indian jungle than is the policeman in the Indian village, but he is there for the definite reason that, unless deer, pigs and monkeys can be taught the principles of birth-control, some check must be put upon their unlimited increase if the jungle is to continue to be able to support them all. And the Leopard, like the Indian policeman, has some very fine qualities. He is generally courageous to a degree, and his physical fitness would put the ordinary human athlete to shame. Further, he can climb trees with the greatest ease; he has marvellous patience when hunting; he can live for days at a stretch without water; and he can conceal himself, thanks largely to his extremely useful spotted coat with which a kindly Nature has endowed him, in a way which is the constant envy of the human hunter, scout or soldier. In addition the mother Leopardess shows great devotion to her cubs, for whom she will fight till the last gasp, and the whole Leopard race would take a very high place in a beauty competition for animals. To counteract this long list of qualities there must be, obviously, corresponding vices, but at least it can be claimed that the latter list is shorter. Undoubtedly Leopards are unnecessarily destructive on occasions, and cases have been known of a Leopard entering a goat pen and killing the whole of the thirty or forty animals which it contained. The Leopard is also less scientific in his killing than the Tiger, so that he sometimes inflicts more pain in the process than is necessary; although it goes without saying that he does not do this with the object of being deliberately cruel, for it is my firm belief that man alone practises the debased vice of cruelty for cruelty's sake. From man's point of view, also, the Leopard has his bad qualities. He is particularly fond of dog-flesh, and many are the loyal and trusted canine friends of man which have ended their career in the stomach of a prowling Leopard. Again some Leopards, generally of a lazy and debased type, discover that in preference to the comparatively hard work of stalking alert wild animals it is much easier to catch and devour the numerous cattle which are so carelessly left about in the neighborhood of Indian villages. They undoubtedly do a good deal of harm in this way, although the fault is not entirely theirs but often lies at the door of those cattle-owners who place temptation in the way by carelessly leaving their cattle unattended at night, in places where they know perfectly well there is considerable risk from a wandering Leopard. But perhaps the Hindu villager is not always quite so careless with his cattle as he seems to be. Like the farmer throughout the world he would not be happy without his 'grouse', and he really kills two birds with one stone when he leaves his old, worn-out and useless cattle where they are likely to be killed by Tigers or Leopards. He provides himself with a very comforting source of complaint and at the same time gets rid of the useless beasts which his religion prevents him from destroying with his own hand. It is even whispered that some of the Buddhists of Burma are distinctly fond of meat, but cannot obtain it because the taking of life is forbidden by the teaching of the great Lord Buddha. Suppose an old cow were to stray into a jungle where a Leopard might be lurking. 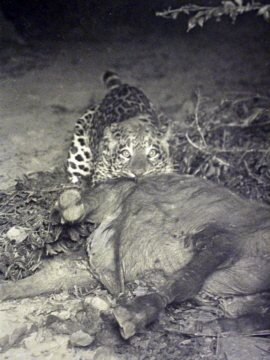 The cow is, perhaps, struck down and the indignant owner arrives just too late to save its life, but not too late to prevent the Leopard from enjoying the meat. Well, the poor cow is dead, and the owner's conscience is quite free - he hasn't taken life! But why leave good food to be eaten by such sinful creatures as Leopards? Why waste what is really his own property? Then there are the fatal accidents which frequently occur when men hunt Leopards for the sake of sport. Well, few sports appeal to the true sportsmen unless they require considerable skill or entail a certain amount of risk, and the hunted Leopard cannot be blamed for putting up the best show he can. After all, the hunter is armed with a marvellous rifle with which, provided he has sufficient skill in its use and the necessary knowledge of woodcraft, he can kill the Leopard long before the latter can approach sufficiently near to make use of the close-contact weapons of teeth and claws which are all that Nature has given him. 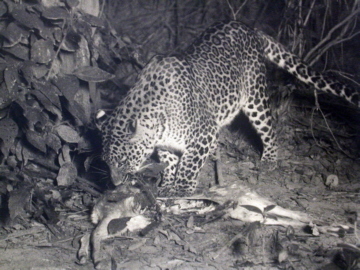 If the hunter makes a mess of things and wastes the tremendous advantages he has - well, it is undoubtedly very sad, but the Leopard is fighting for his life in an unequal contest, and it is only fair that he should occasionally turn the tables and kill the man, who is trying to kill him often for the sake of pleasure alone. May the day be far distant — as it undoubtedly will be — when the name of the Leopard will have to be added to the long list of wild animals that have been exterminated by the hand of man.